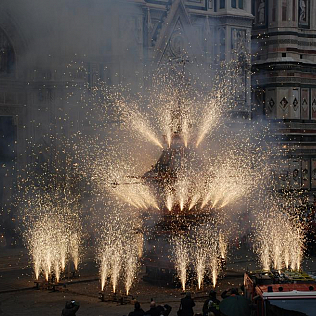 For Florentines Easter Sunday means most of all the Scoppio del Carro (the Explosion of the Cart), a tradition originating from some events of the First Crusade. Lore says that in 1099 – when Crusaders conquered Jerusalem – the Florentine Pazzino de’ Pazzi was the first to climb the city walls and to display the vermilion and white flag. For this reason, three flints from the Holy Sepulchre were given to him. After he came back in Florence, the stones were kept in the Pazzi Palace, but later they were moved to the Santi Apostoli church, where they are still today. Lore says that, during the Easter in Jerusalem, Crusaders gave the blessed fire to the people, as a sign of purification. Since then, the custom to light a fire with Pazzino’s stones on Easter Sunday has spread in Florence. In the past the fire was lighted in the cathedral, and guys used a torch to bring it to the houses. That was the beginning of a tradition, that has become a very structured ceremony. In the past it was organized by the Pazzi family. However, in some periods, they took no part in it because of their clashes with the Medicis (it is necessary to remember the very famous Pazzi conspiracy, because of which Giuliano died and Lorenzo the Magnificent was injured). Probably at the end of the 14th century not only the habit to carry the fire on the cart but also the use of fireworks were already a tradition. Nowadays the ceremony takes place on Easter Sunday morning. At about 10am, in the church of Santi Apostoli, the priest lights a candle, using Pazzino’s stones. From the church a procession starts and arrives at the Duomo. At the same time, from Porta al Prato square the cart – drawn by four oxen – moves towards the Duomo too. When the cart arrives, an iron cable is stretched from a column – put at the center of the choir of the cathedral – to the cart. The Colombina (Little Dove) – the rocket that makes the cart burn – will follow the cable. Now it is time for fireworks! This is a tradition Florentines are very fond of, and a chance to discover the real customs of the town. If you are in Florence for Easter holidays you can’t miss the Scoppio del Carro!